This week, I am re-posting a blog I shared in April, about Chapala Gardens’ rooftop farm. Since my visit this spring, Jake Kelly’s farm continues to expand and realize significant success. This extraordinary young woman has really become an important part of the local food scene in Santa Barbara, Calif. If you live in Santa Barbara and want to buy local food, you can find Jake and her delicious, chemical-free local produce at the Sunday Farmer’s Market in Goleta from 10:00 a.m. until 2:00 p.m. Chapala Gardens is also open for shopping on Tuesdays from 11:00 a.m. to 2:00 p.m., and on Thursdays from 3:00 p.m. to 6:00 p.m.
For Chapala Garden’s address and directions, visit www.ChapalaGardens.com. If you live on the east coast, see Jake in Orlando, Florida on Thursday, October 17. 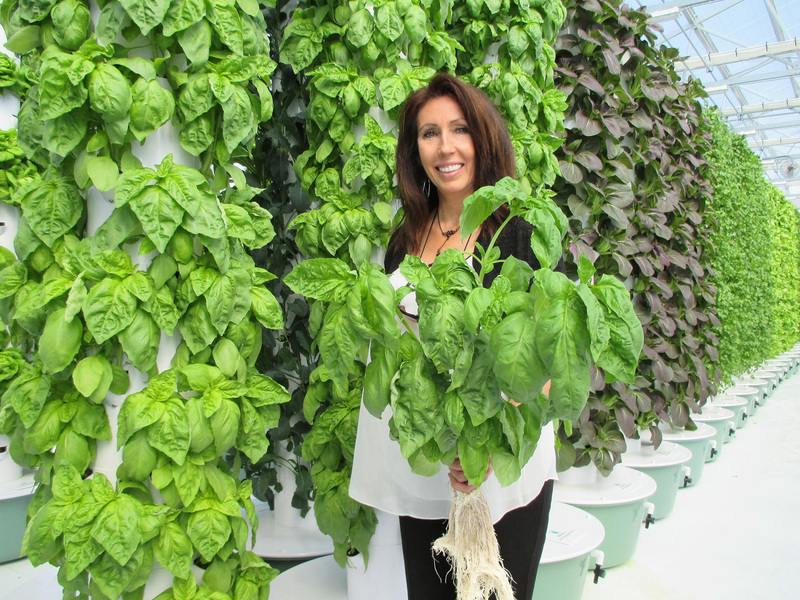 She will be providing training on the patented Tower Garden® technology at the Tower Garden/Juice Plus Fall Leadership Conference at the Gaylord Palms Resort & Convention Center, October 17 through October 19. Now in its second year of operation, Chapala Gardens has been extraordinarily successful in making local, healthy, chemical-free, low-carbon footprint food readily available to its friends and neighbors in Santa Barbara. Behind every successful “green” business is a person with a passion, and that is certainly true for 25-year-old Jake Kelly, the head grower for Chapala Gardens. 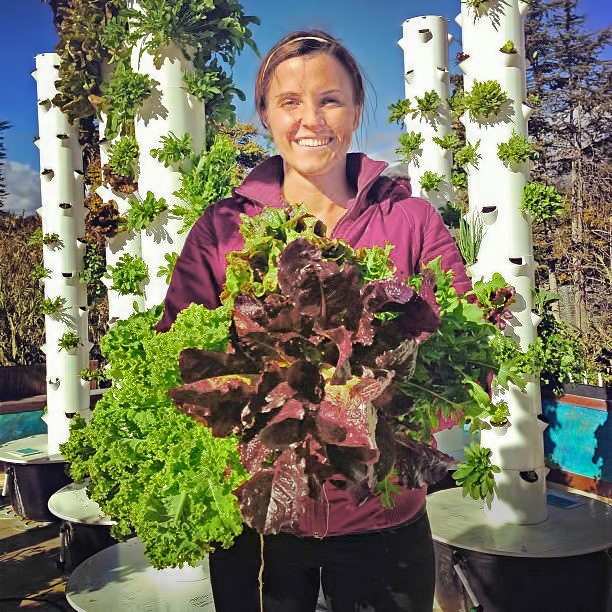 Jake has been passionate about growing healthy food since she was young girl. She grew up in Waldorf Education, where farming was part of the curriculum. After she earned her Bachelor of Arts degree, she went to Europe to work and learn on organic farms. Jake Kelly holds a bouquet of lettuce. 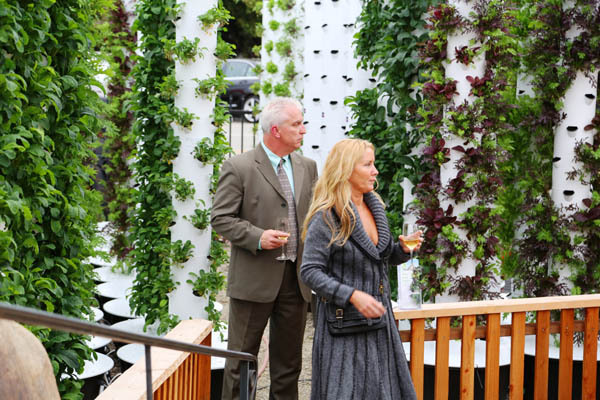 While she was away, her parents Joy and Sandy decided to open California’s first vertical aeroponic Future Growing® rooftop farm. When she returned home, Jake immediately took on the role as head grower of Chapala Gardens and launched the thriving business. Jake was recently nominated for Young Female Entrepreneur 2013 in Santa Barbara CA. 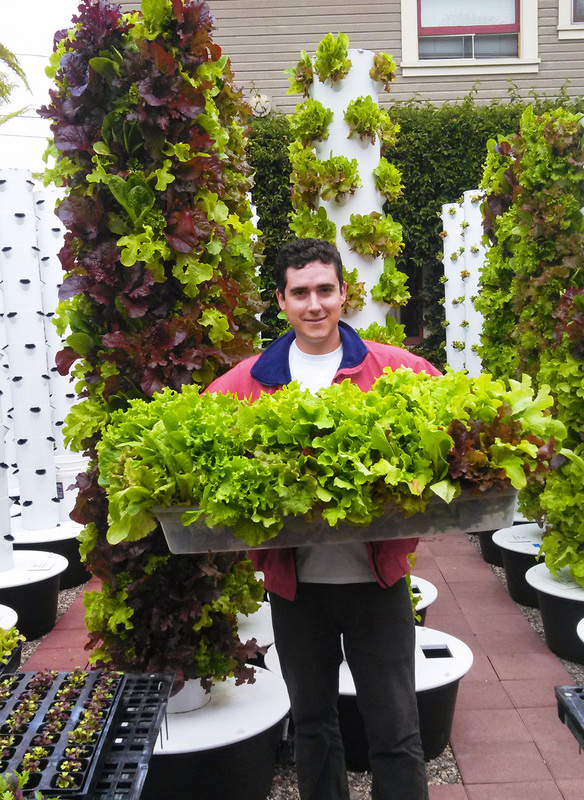 Now, Jake’s rooftop farm is home to 40 commercial Tower Gardens® with 44 plants per tower. Providing food for the community through the local farmers market. Leading a Community Supported Agriculture (CSA) farm. Educating and training people how to do the same thing right in their own back yard. 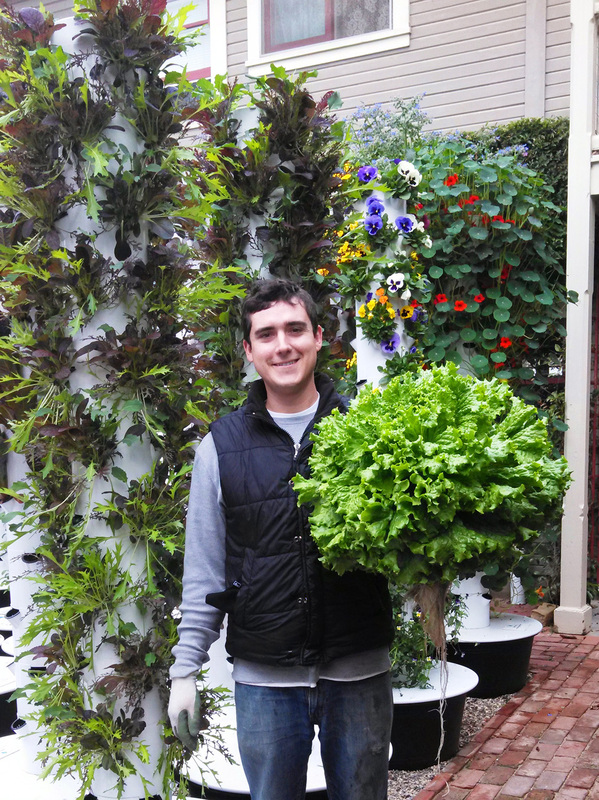 Jake Kelly with freshly harvested “living” lettuce. As a young woman with a big heart who cares about the planet and humanity, Jake is on a mission to show people that there is a solution to the environmental challenges we all face with new and innovative green technologies. This entry was posted in Posts and tagged Beneficial insects, Chapala Gardens, chemical-free food, farm to table, farm to table movement, farmers market, Future Growing, Future Growing LLC, green rooftops, Integrated Pest Management, IPM, Jake Kelly, Jessica Blank, live produce, Living Produce, local food, Local Food Movement, locavore, locavore movement, modern agriculture, natural foods, Non-GMO, Non-GMO Foods, non-GMO products, Pest control, pesticide-free food, reduce the carbon footprint, Restaurant, Rooftop Farm, Rooftop Farmer, rooftop farming, Santa Barbara, Santa Barbara California, sustainability, sustainable, Sustainable agriculture, sustainable food, sustainable food movement, The Vertical Farmer, tim blank, Tower Garden, Urban Farm, Urban Farmer, urban farming, vertical farm, Vertical Farmer, Vertical Farming, vertical growing, water conservation in agriculture on October 9, 2013 by futuregrowing. Is The Water Crisis Over in California? Meet Alex Thomson, the Vertical Farmer Who May Have a Solution! In today’s world of “green washing” and “marketing makeovers”, it is a genuine pleasure to meet a real “green” entrepreneur making a difference in the local food movement. 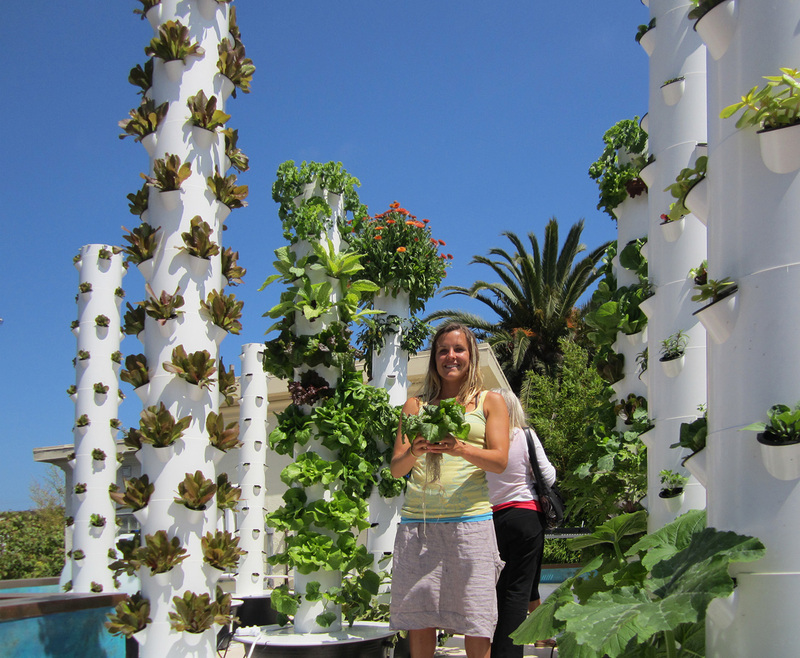 The entrepreneur’s name is Alex Thomson, the Vertical Farmer, founder of Montecito Urban Farms in sunny California. I recently visited Alex and his team at their farm’s Grand Opening event in Santa Barbara, CA. 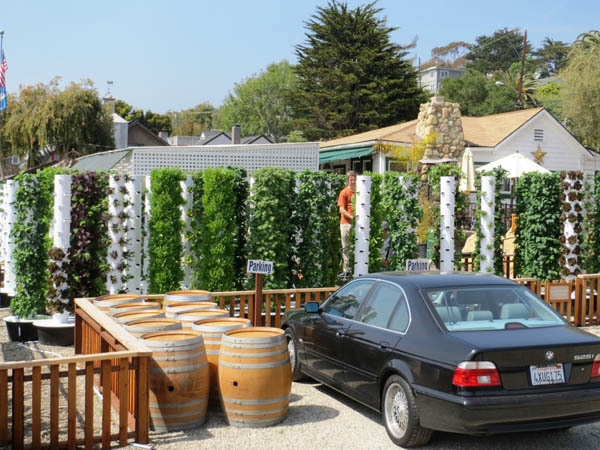 I was delighted to see the somewhat unconventional location of the farm: what was once unused parking space filled with weeds is now home to a 150-tower vertical forest filled with a bounty of food crops. And all of this in the middle of a busy California urban environment, just a few blocks away from the beautiful Pacific ocean. I sat down to interview Alex and here is what he had to say. 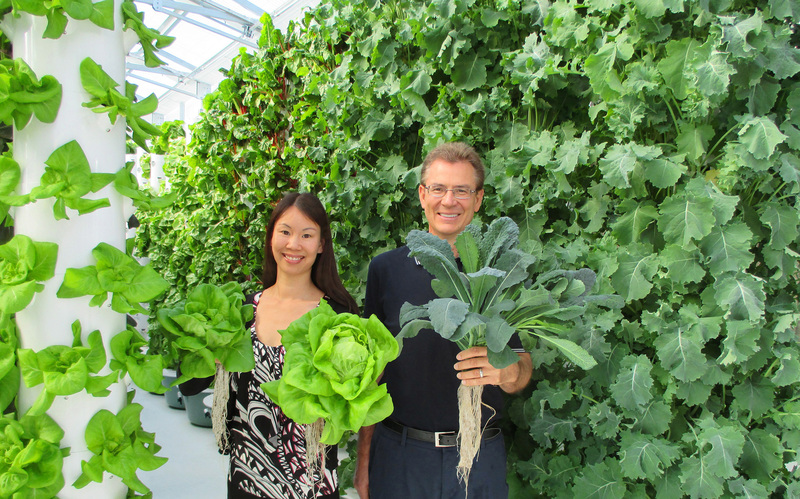 What inspired you to become a vertical farmer providing local food? I had been successful at other businesses and was really looking for something new. I wanted to do something that would make a difference for our planet, something I could be proud of, and something that would contribute to humanity in a positive way. I always liked growing plants. There is something very therapeutic about it: you plant a seed, nurture it, watch it sprout and grow, and then it develops into a beautiful, healthy plant that will benefit someone else. What could be more rewarding? When did you take the first step towards your dream? A couple of years ago, I started exploring how I could become a local food farmer. I started searching online, and wow, let me tell you, you can’t imagine the magic snake oil I came across in my journey. There were all kinds of unsubstantiated claims about the next magical growing system. From stacking Styrofoam, to a box of fish to go, I saw it all! Meanwhile, aquaponics seemed to be all over the place with a new seminar popping up on every block, so it really interested me. However, the more I investigated it, the more I found dead fish rather than successful farms. I could not find a single successful for-profit aquaponic farm, and it seemed very risky from those I had talked with who had actually done it. Almost every project that aquaponics companies showed me had been open for only a year or less, or was for educational purposes only. That may be fine for a school, but I was looking to start a for-profit business: one that is financially sustainable with proven success and something that I could make a living at and pay my employees a fair wage. Unfortunately, it is a story I have heard all too often. How did you get on track to something successful? 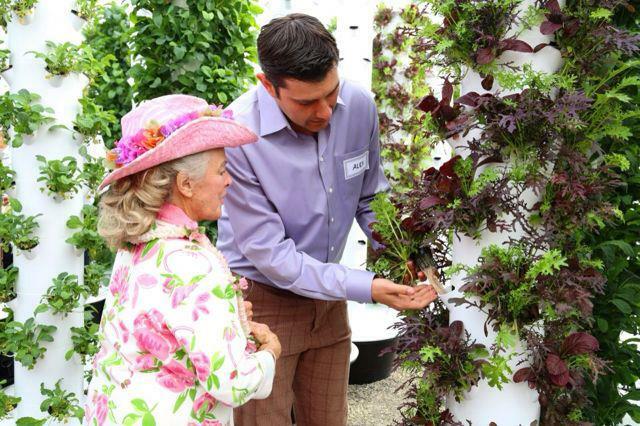 Everything changed for me when I met a man named Todd Mehl and he introduced me to the Tower Garden®. A month later, Todd introduced me to Future Growing® Founder and CEO Tim Blank, who was in town speaking to our mayor, several other local politicians, and business leaders on sustainable farming practices utilizing the Tower Garden® technology. Once I saw the technology in action, there was no turning back. 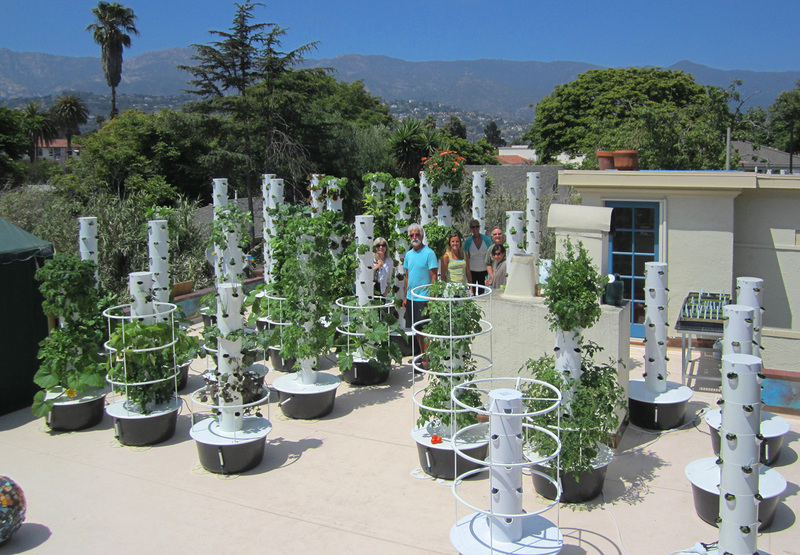 I had never seen anything produce food as simple, clean, and easy as the Tower Garden® technology. 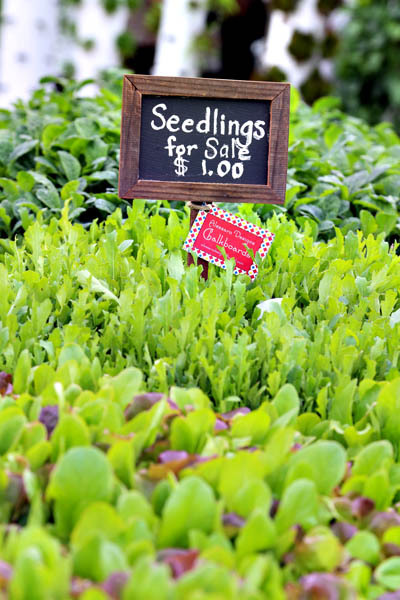 I immediately bought my first home-based micro-farm and it seemed almost bullet proof. In no time at all, I was hauling pounds of fresh produce to the local restaurants. What happened next was a bit astonishing! The chefs at that time did not know me personally, but went crazy over the freshness, quality, and flavor of produce I was growing! They told me, “We cannot get this quality even in California.” I thought about how crazy that is, since so most of the nation’s vegetables are grown right here in California. They chefs told me they would take all I could grow, and from there I was off and running. I formed a quality business plan based on the successful results of my micro-farm, found a location near local restaurants and foot traffic, ordered my farm, and was up and growing in a matter of days. That is how simple the technology is. I am really good at this now and I did not go to school for this. While my farm was being shipped, I actually trained hands-on at other successful Future Growing® farms. Todd Mehl launched the farm with me and, together with a few interns we employ from the local collage, we harvest 2,200 living plants a week! But the story gets much bigger than that! Look, the carbon footprint that food leaves on our planet is no longer a secret but a sad nightmare. Pesticides, environmental contaminants, contaminated water, food-borne illness, and low nutritional food are the real challenges facing our modern food system. In the state of California, we are running out of water for agriculture and people and it is one of the most serious issues our state faces in the coming decade. There seems to be no real solution coming from our elected officials. Climate change is bringing early seasonal changes such as freezes where we don’t normally have them. In fact, California farms suffered one of the worst freezes this winter. But get this: while they were freezing, our vertical farm that grows food off the cold ground did not freeze and we continued to harvest all winter long! I had several farmers come by and scratch their head as they watched us harvest produce right after the last freeze. I am now friends with several of them. All our clients are restaurants in the local area. For the restaurant next door, we simply walk the produce to the kitchen, which has a travel carbon footprint of zero. It does not get any greener than that! 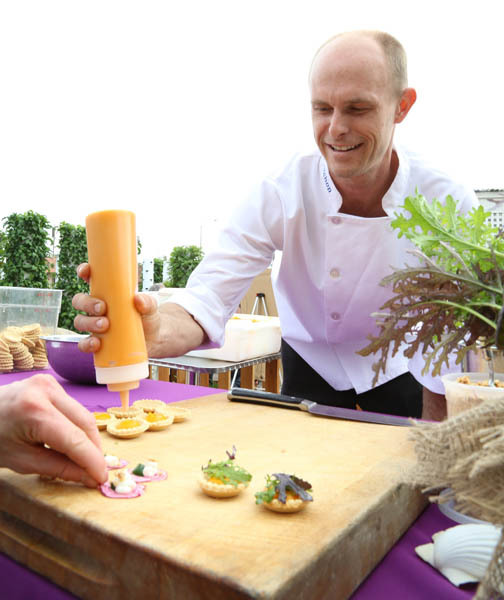 Our local chefs actually come and do events and dinners right on site at our farm. They have become our partners and friends in this community. 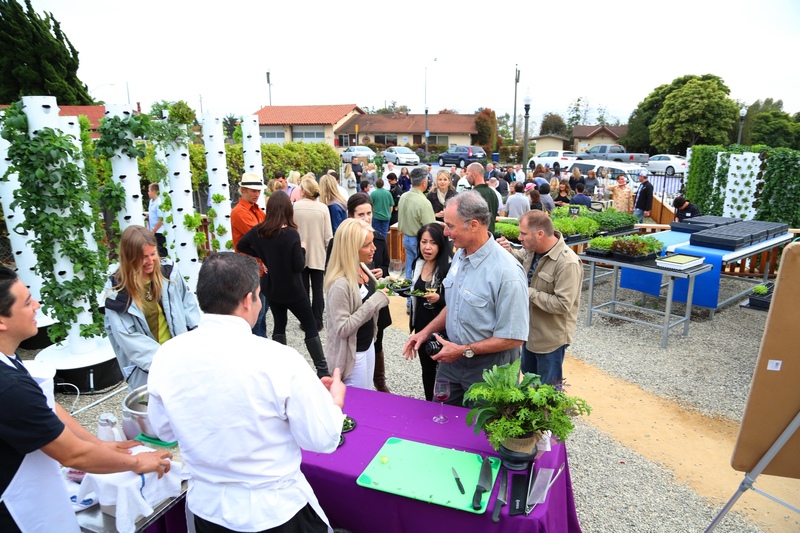 How do you feel your produce differs from the traditional farm sources in California? Where do I start? Let me start with the most important component to all plant life: water. It is common knowledge that much of the California water supply is polluted with farm chemicals, other industrial waste or runoff, and environmental contaminants. This limited and precious water supply in California is shared from field to field as it travels south. So is an organic farm really that organic? I don’t know, but we are gaining more scientific knowledge about this each year. Modern agriculture uses a lot of disposable or low-grade plastics. 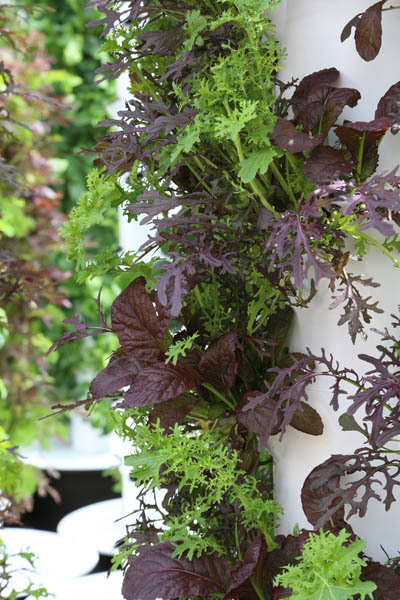 Our vertical farm is made of safe, heavy duty, food-grade plastic designed for decades of use. We spray no herbicides. We spray no chemical pesticides. 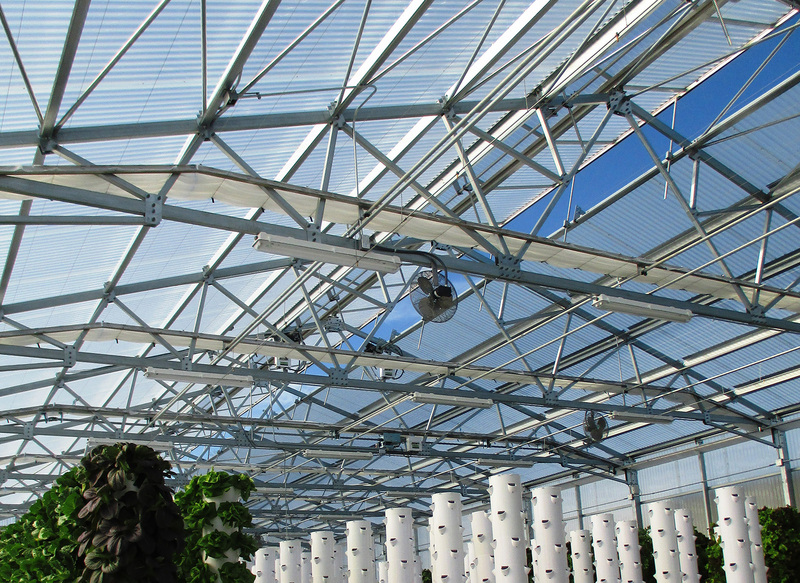 Food-borne illnesses found in soil are non-existent in clean aeroponic systems that grow vertically and are off the ground. And, get this: we use up to 95% less water than conventional farming and grow this food on 90% less land. Because the farm is local, we employ local people, producing a positive financial impact on our local community. Most of our nation’s farms, I believe, are genuinely doing the best job they can do to grow food with the big agricultural paradigm that exists today in our country. It is hard for me to believe and amazing at the same time that we have this extraordinary technology to grow safe food with a small fraction of the water, land, petro-chemicals and chemical pesticides that modern agriculture uses. The water crisis could be close to over if we all grew like this! What are the top 3 things that have surprised you most about having this farm? How quickly we were successful. I mean, we were almost sold out from day one. How easy it is to be a success with the right training and technology. 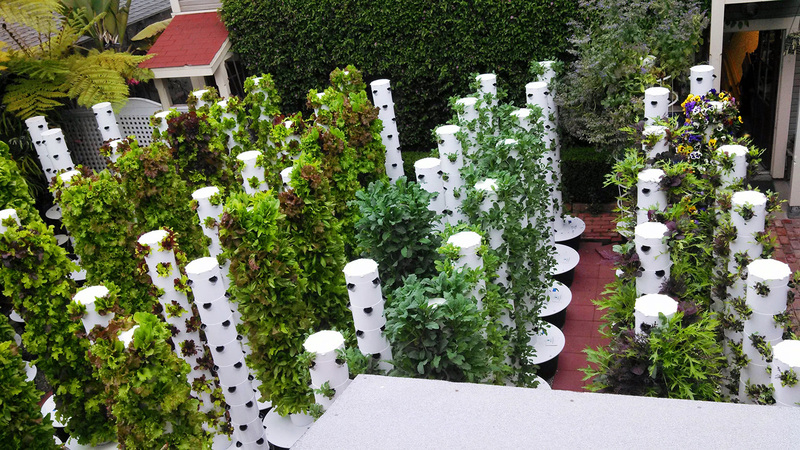 I had a lot of business experience but I did not have any experience in growing food until I started with my Future Growing® Tower Garden® farm. 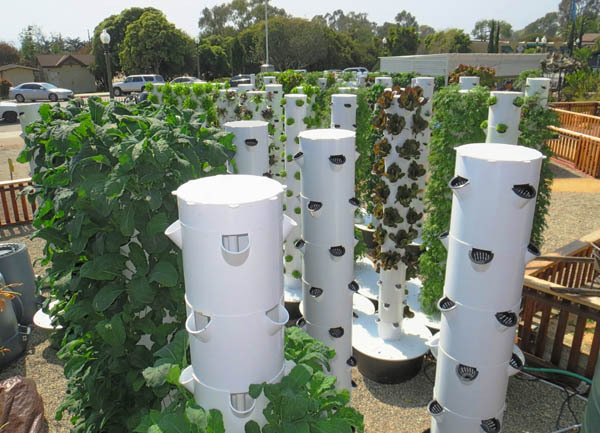 The most surprising thing to me is how many people see our farm and want to do the Tower Garden® franchise for the residential market at the end of 2012, and it simply exploded before my eyes. In a half a year, we have literally trained hundreds of people at our farm to do the same thing right in their own back yards. Imagine for a moment that, if every family in America had at least one Tower Garden® in their back yard, there would be millions of pounds of produce that would not have to get on a truck. Think about how significantly our carbon footprint on this planet would be reduced. That is my next mission! Alex, can people see your farm, buy produce directly from you, and take classes at your farm? Absolutely, we are open to the public. 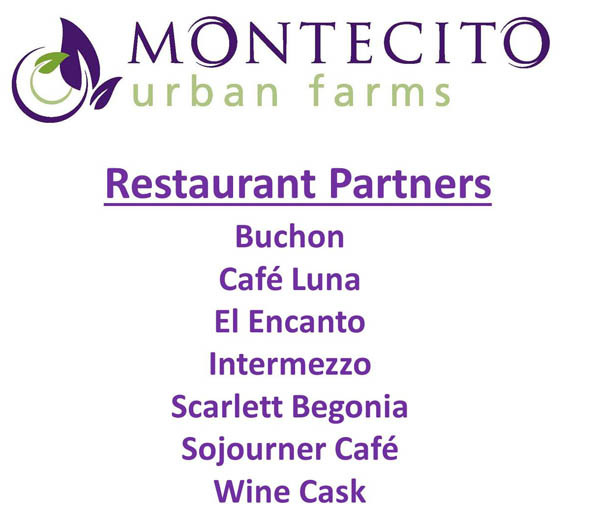 To learn more, you can visit us on line at http://www.MontecitoUrbanfarms.com. This entry was posted in Posts and tagged agriculture, Business, California, Local Food Movement, modern agriculture, Santa Barbara, Santa Barbara California, Sustainable agriculture, Tower Garden, vertical farm, Vertical Farmer on May 8, 2013 by futuregrowing.